I read this article and found it very interesting, thought it might be something for you. The article is called India’s Medical Education In Extortionate Private Hands and is located at https://archive.indiaspend.com/sectors/indias-medical-education-in-extortionate-private-hands-15998. Every year, millions of young school passouts take multiple gruelling exams to secure a medical seat. In a nation of 1.2 billion people, only around 52,000 students are admitted annually to India’s undergraduate medical courses. With few subsidised seats in government medical colleges, students are forced to shell out exorbitant fees to study in private ones. 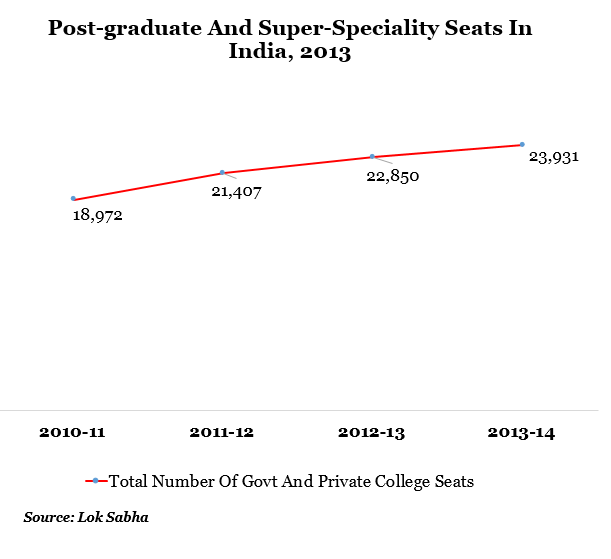 Today, the number of the private medical colleges has surpassed the number of state/central government colleges. 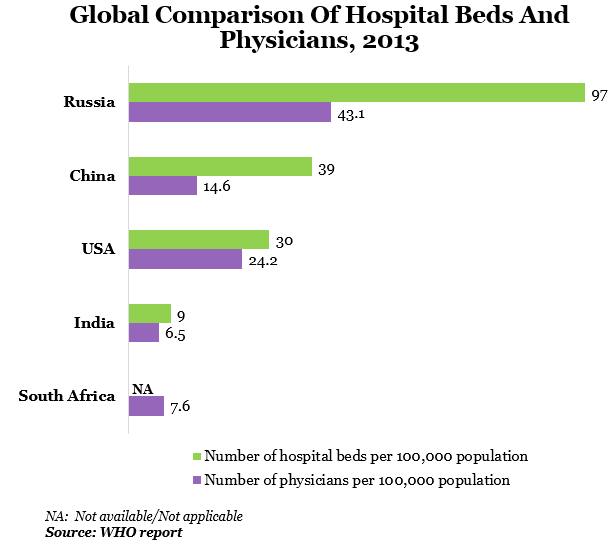 Here’s why the situation is dire: For every 100,000 people, India has only 6.5 doctors; in contrast, China has 14.6. The World Health Organization’s World Health Statistics 2013 report highlights the deficiencies in India’s health systems compared with BRICS nations and USA making a case for India to produce more doctors. 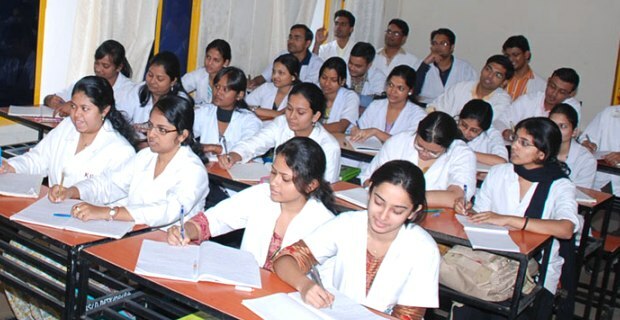 Now, lets look at the state of medical education in different Indian states. Both in terms of number of colleges and seats, private colleges have an upper hand. Some 66 colleges have come up in the last 3 years. In all the top 5 states with the highest number of medical colleges, the share of private colleges is more than that of the government colleges. 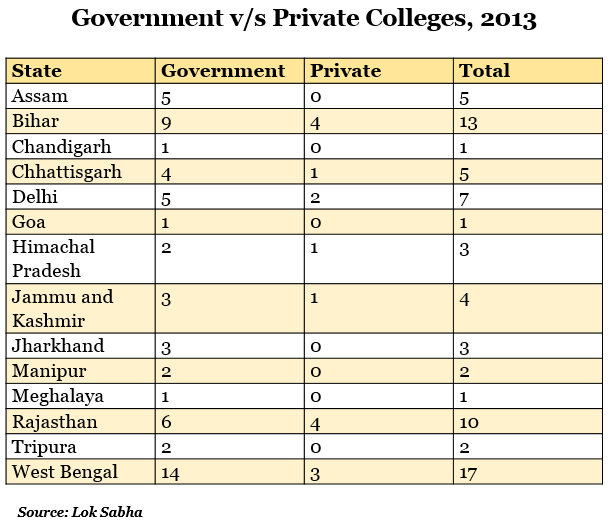 In Karnataka, for example, the number of private colleges is almost three times the number of government colleges. 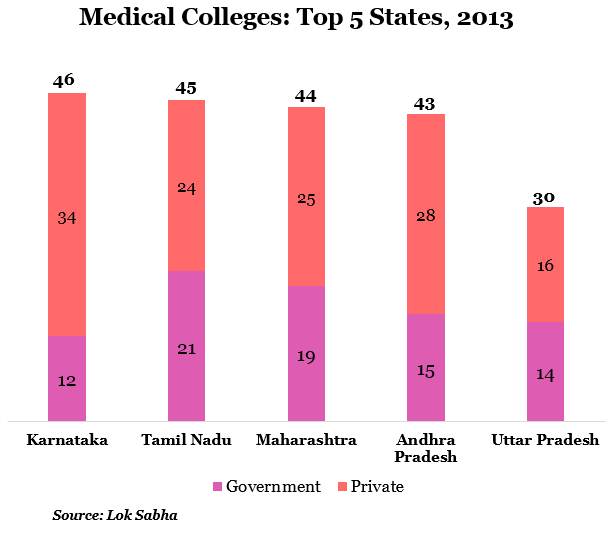 Although Andhra Pradesh has fewer medical colleges than Tamil Nadu, it admits more students annually. 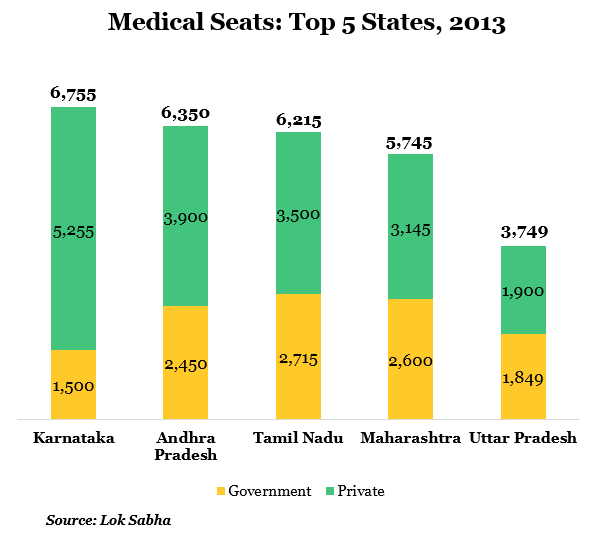 In Karnataka, just 22% of the total medical seats are in government colleges. In this year’s budget, the newly-elected Congress government in Karnataka has promised to start four new government colleges. 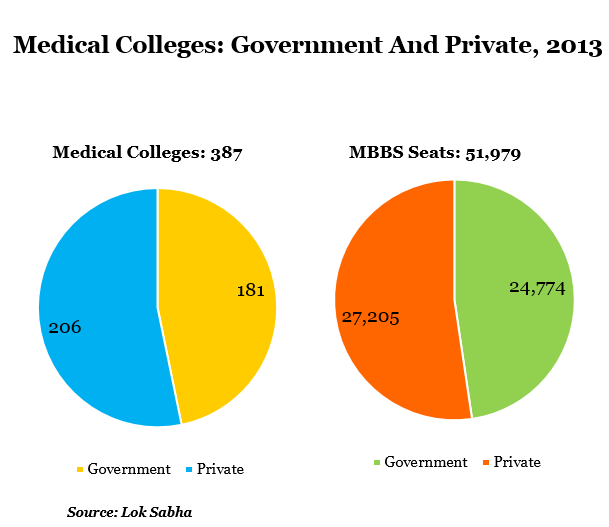 Only in Uttar Pradesh, the share of medical seats is equally distributed between government and private colleges (albeit marginally higher in private colleges). 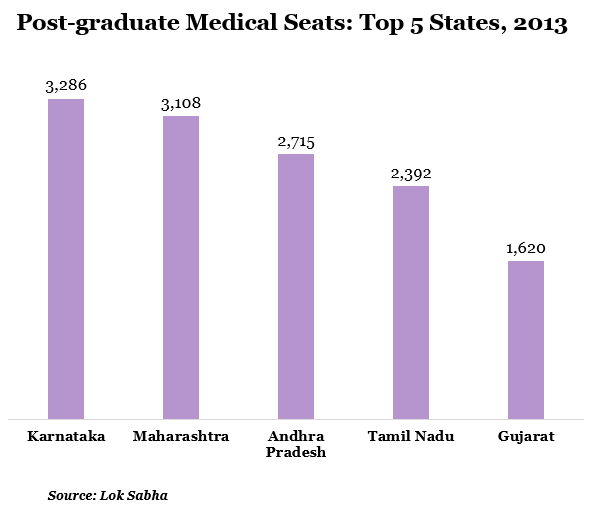 The top four states in list also feature in the top 5 states with maximum under graduate (UG) medical seats. Gujarat is the new entrant here. Although Uttar Pradesh has more undergraduate medical colleges and MBBS seats than Gujarat, the latter has more post-graduate seats. There are 1,620 PG seats in Gujarat compared with 1418 in Uttar Pradesh. Given the limited access to medical education in India, irregularities are rampant in admission process and corruption in granting approval/recognition to medical colleges. 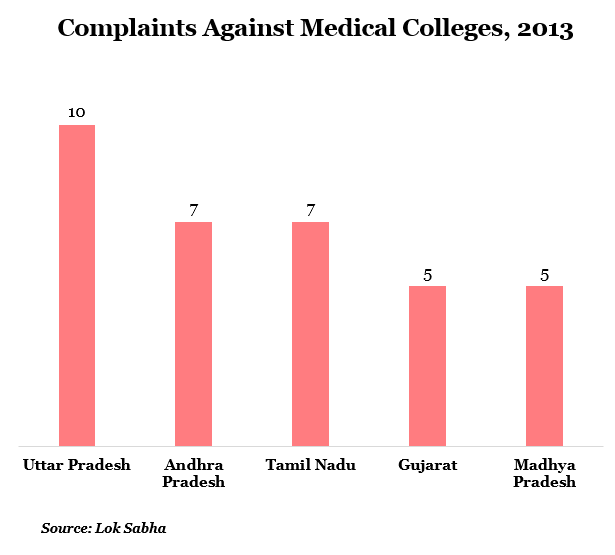 Since 2009, the Central government has received 60 complaints against medical colleges in India. 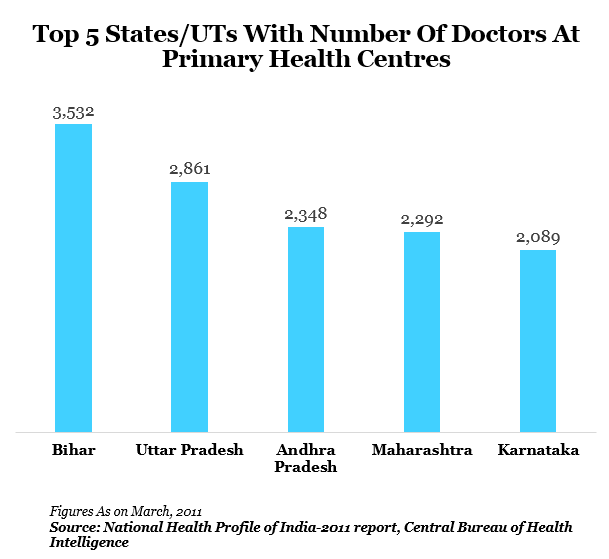 Are there (enough) doctors in rural India? There is a huge manpower crisis plaguing primary health centres (PHCs), which are lifelines for the poor in rural India. 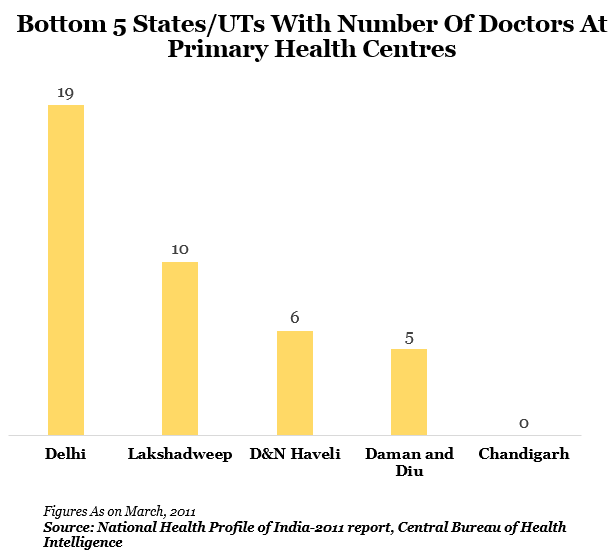 The table below highlights the inequalities in availability of doctors at PHCs across states. Interesting to note that states which have high number of medical colleges have maximum number of doctors in rural areas. It’s not necessary that more Government colleges will in itself be the solution. A sense of competition and regulation might work better to bring down fees among private colleges. Remember, most of the additional `fees’ collected by the private colleges are unaccounted for and secreted away. It’s also surprising that very little or no attempt is made to track down these stashes which everyone knows it’s there. Why they are not tracked down is another story though.